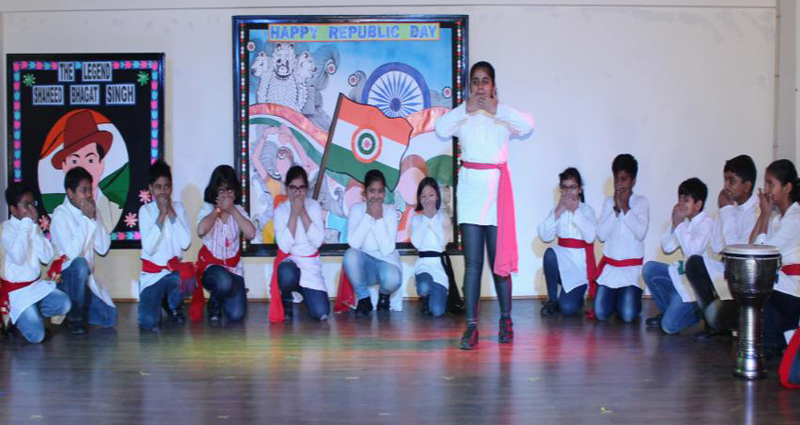 Evoking the national spirit, the Manthan School celebrated India’s 70th Republic Day in a special assembly. It was a sacred occasion, marked by an enthusiastic display of patriotism by students. The program began with mesmerizing dance and drama performances by the pre primary students of Hatchlings, Nestlings and Fledglings depicting the contribution of the great Indian Freedom Fighters and paying them tribute for an extensive role they played in attaining independence for the country. Grade 5 students sung "Mile Sur Mera Tumhara" melodiously depicting unity in diversity. Despite having diverse culture, languages, religions and traditions we all stand together as one! To mark the occasion students of Grade 6 performed Nukkad Natak to spread awareness about the necessity of voting and to encourage young generation towards the voting rights. Students from Grades 4 to 8 participated in the Mock Election Process, marking the celebration of the ninth National Voters Day and highlighting the theme: "No Voter to be left behind" was highlighted during the election process. It also kindled the importance to increase the effective participation in the electoral process among voters and educating them through simulation. A thought provoking performance was presented by the students of Grades 3 and 4 who portrayed the inner strength of women and gave a deep message of "Say No to Violence". The values and ideas have to be worked out by the thriving society in order to step forward for a better tomorrow.